Workshops Now is the time to sign up! NEW - now you can pay for your workshops using your credit card. Workshops are a favorite perk of EBHQ. You will meet a world-class fabrics/design teacher in a small group setting (no more than 24 people). The workshop space at 980 Stannage is airy and bright. Exposure to new techniques will inspire you and you will go home energized from the creative and social workout. Need to do some shopping for supplies for a class? Check with one of our retail affiliates to see if they have what you need. The yearly membership dues our affiliates pay help to support our guild and the good work we do. Workshops are from 9:00am to 4:00pm. The workshop space opens at 8:00am if you want to arrive early. For millennia, people have created practical warm garments using the process of felting (raw fleece) or fulling (woven cloth), agitating wool fibers until their microscopic scales “catch” each other, matting and shrinking into a denser material. In this workshop we will apply quilting techniques to this ancient method, exploring wool’s shrinking characteristics by layering fleece, yarns, and special fine gauze fabric with cotton, silk, and other non-shrinking materials through hand stitching or machine sewing. We will learn how to effectively dye with indigo on delicate wool, silk, and plant fibers by controlling pH and temperature to achieve varying intensities of blue. Through simple and selective washing and dyeing of the layered cloth, we will transform its surface, creating added dimension and texture mimicking the aesthetics of Japanese boro cloth or intense naive pieces by Nui Project. $35 per person supply fee paid to instructor includes Natural indigo - Henna/fructose/fruit for dye vat; Pickling lime for dye vat; Japanese fulling wool (2m X 60cm per person); Cotton, linen, polyester squares (approx. 28"x 28"; 4 per person); Needles and thread. You may enroll and pay by credit card by clicking here. This is our second year working with the Social Justice Sewing Academy—an art program that bridges artistic expression with activism. By using textile art as a vehicle for personal transformation and community cohesion SJSA empowers youth to become agents of social change. Work one-one-one, mentoring a local high school student for the day to make a block or mini quilt, helping each student realize their design. Embroider and embellish blocks that have already been made. Put together embellished blocks into quilts. We’d like you to bring your sewing machines and some thread that the students may use under your supervision or that you can use to put blocks together into quilts. There is no workshop fee and we’ll do a pot luck lunch. Monday Workshop, May 20: Fabric Postcards! Every 2 years at Voices in Cloth, EBHQ makes hundreds of postcards available for donation at the quilt show—this is a big fundraiser for us. During this Monday workshop, we’ll be making postcards for the 2020 Voices in Cloth. Kits will be available or you can bring your own fabric and embellishments. There will be technique demonstrations throughout the day. Do bring your sewing machine, your usual sewing tools, and some thread. Bring your lunch or plan to get something from one of the nearby restaurants. In this hands-on fabric painting workshop where participants learn (some oftentimes rather surprising) techniques for using sun-reactive transparent color paints to create uniquely textured and colored fabric. The focus is on how best to use and layer the paint, how to use various resists, and – depending on desired results – how to most successfully influence or cause (and control) layer-by-layer differential paint absorption, diffusion, blending, and/or mottling. Resulting fabrics can be remarkable. 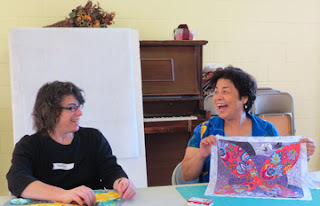 Each participant leaves the workshop with a range of their own highly textured fabric in the colors and textures that they have selected to bring unique depth and complexity to their art quilt projects. The two day schedule ensures plenty of time for in-depth hands-on "guided experimentation" and techniques exploration. The workshop format is also designed to provide substantial opportunities for individualized and focused one-on-one teaching and feedback. While Denise’s work often uses imagery of stones, this workshop is not specifically about stones, or even landscapes, but instead about fabric painting techniques capable of dramatically improving quilt color and texture, dimensionality, and design integrity, regardless of quilt theme or focus.